School has been in full swing here for a while now. And with that comes all of the other activities that start up such as sports, dance practice, piano lessons, after-school clubs, scouting meetings and a plethora of other events. While I love all of the things my children are involved in it definitely makes for busy days. I feel like I’m constantly coming and going here and there and trying to keep track of what time six different kids need to be to someplace and where that place is! What that means for me is if I’m not completely on top of things the day gets away from me rather quickly and all of the sudden I’m looking at the clock and it’s telling me it’s 5:00 pm. Then I’m wracking my brain wondering what in the world I can quickly make for dinner! This happened to me just the other day. My kids started asking “What’s for dinner?” and I had no idea. I had at least a hundred other items vying for attention in my brain and I knew I didn’t have the energy or the focus to come up with anything difficult. After looking through my pantry and fridge and after scouring my recipes very quickly I knew exactly what to do. 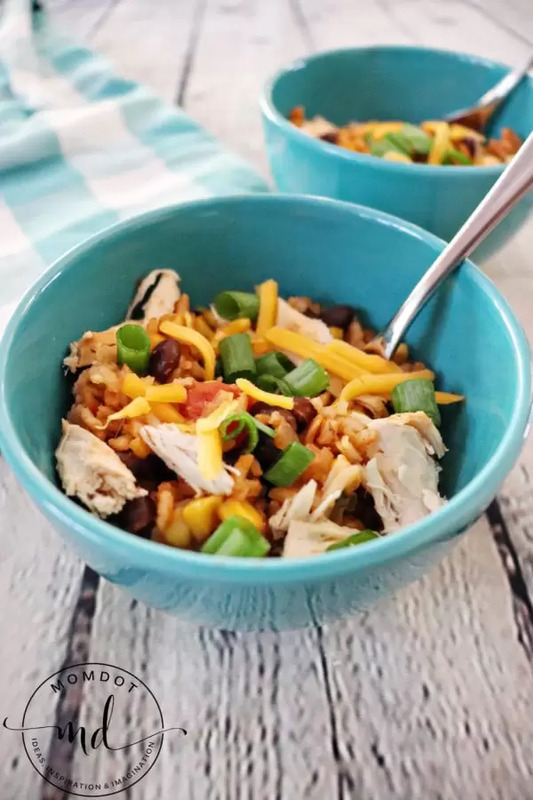 Make Instant Pot Chicken Taco Bowls. This type of recipe is a love of mine. This is because you can dump everything in at once, set the time and leave it. It is simple and delicious! The best part with this easy recipe is I can continue concentrating on all of the things that need to be done in a household with six kids instead of slaving over a hot stove for hours! So enough with the chit-chat about my crazy life, let’s get going on these amazing chicken taco bowls right now. You’ll love how quick they are and how they may just make your crazy life a bit easier. First, pour half of your chicken broth into the Instant Pot. Second, place your chicken breasts in. Third, cover the chicken with taco seasoning. Helpful hint: You can decide whether you would like just a bit of taco seasoning or a whole lot to give it a kick. My kids don’t care for spicy things so I take it easy with the seasoning on our chicken. Next, pour on the black beans and corn. Add the salsa. This is another area where you can choose how spicy you’d like this dish to be. I use mild salsa for my family, although I know some people who can’t get their salsa hot enough! Add the rice on top of everything else. Pour the remaining chicken broth on top. Helpful hint: Use a fork to gently press the rice down until it is covered in the liquid. If you don’t there’s always a chance some of the rice won’t get enough moisture and you’ll get a bit of crunch in your end product. Put the lid on and secure it. Hit your settings and relax as dinner practically cooks itself! You’ll want to let the Instant Pot do a natural release for a few minutes before you turn it to a quick release. Then remove the lid and very carefully fluff the rice with a fork just a little bit. If you mix or stir it too much then you’ll end up with a pretty mushy mess. You can let the rice mixture sit for a minute while you prepare any toppings that you want. Then gently move the rice to the side, pull out the chicken and shred it. My chicken was perfectly cooked and shredded with ease. Finally, add a scoop or two of the mixture to a bowl. Put the chicken on top and then any other toppings you have ready. 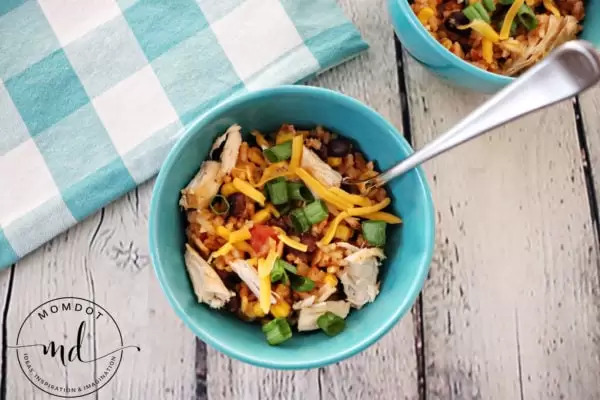 This recipe for Instant Pot Chicken Taco Bowls will make you a superhero at suppertime. It's quick, easy, and full of flavor. A dish everyone will love. 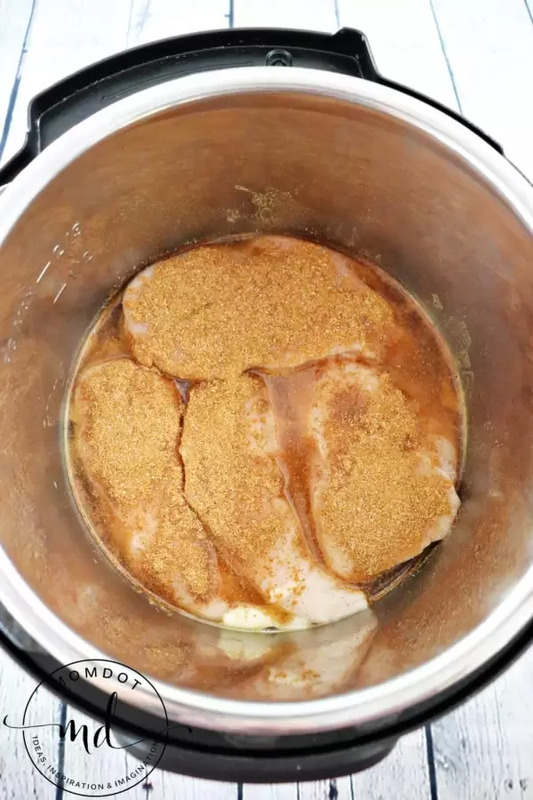 Spray the bottom of Instant Pot with non-stick cooking spray. 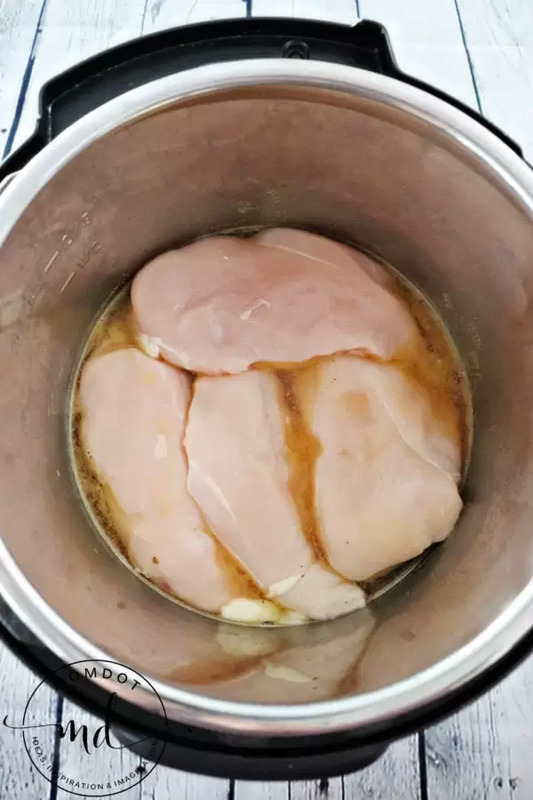 Pour 1/2 cup of chicken broth into Instant Pot. Cover chicken with taco seasoning. Add 1 cup of chicken broth. Push rice into broth until fully covered. Cook on manual at high pressure for 9 minutes. Let pressure release naturally for 11 minutes. Turn valve to quick release. 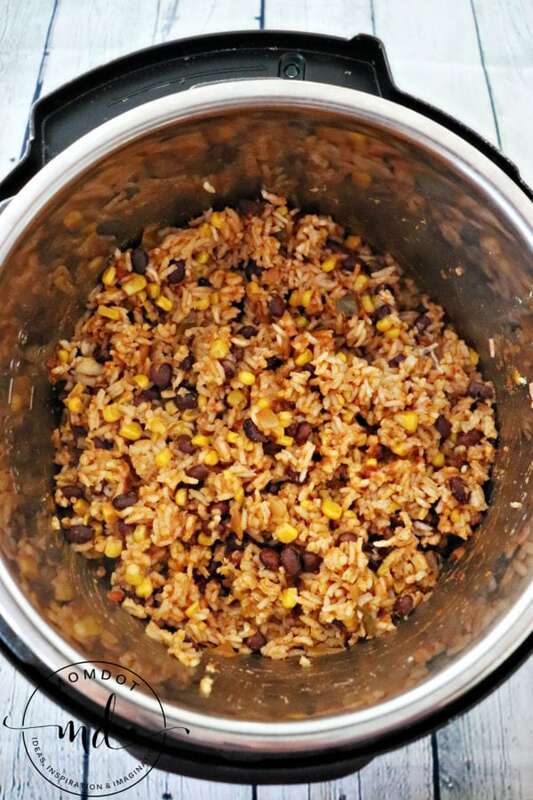 Remove Instant Pot lid and carefully fluff rice with a fork. Move rice aside to reach chicken breasts. Remove them and shred. Add a scoop or two of the rice mixture to a bowl. Add shredded chicken and other prepared toppings. You can always make small changes to this recipe that will still give you a great tasting dish. You can change out the chicken for ground turkey or beef. Just quickly sauté the meat in the Instant Pot first. Then add the rest of your ingredient as directed above. 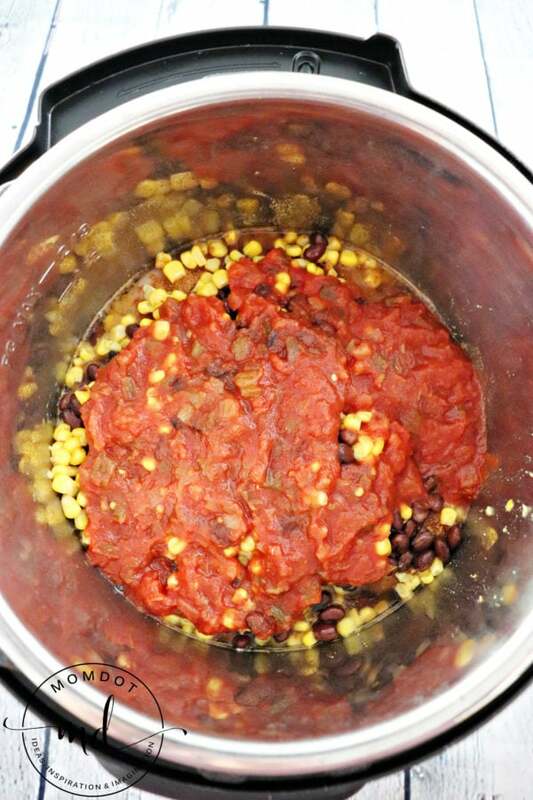 You can also add in other veggies such as corn, bell peppers, or additional bean types such as pinto or kidney beans. I’m excited to try it in all these different ways. 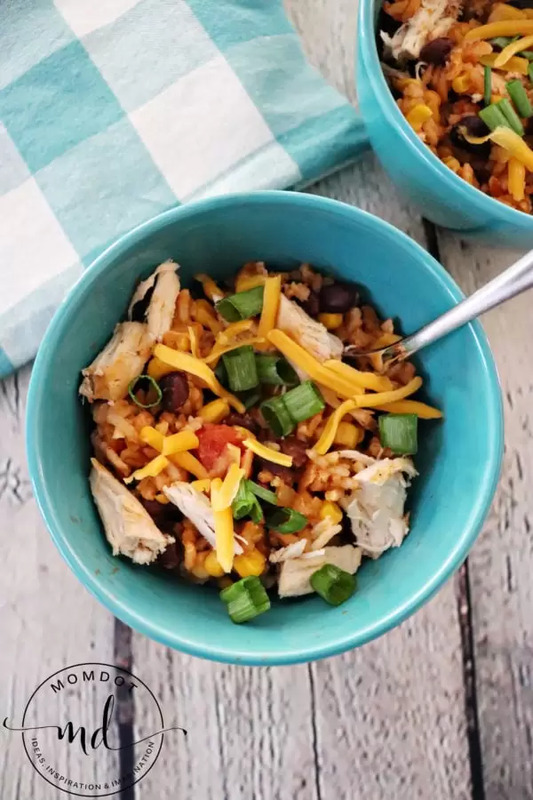 My kids will think they’re getting a new meal and I’ll love that each time it’s just as easy to make in the Instant Pot! 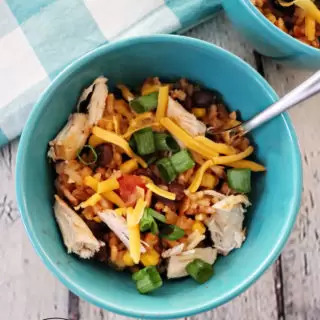 This looks great and easy,but I don’t have an instant pot. But I do have a crock pot I use ALL the time. Is there a way to modify this recipe for my crock pot? Thank you! Cheri, I’ve never tried this exact recipe in the crock pot but your question definitely makes me want to experiment and try it. So be on the lookout for a Crock Pot Chicken Taco Bowls recipe in the near future. In the meantime, I would suggest cooking everything together (except for the rice!) on high for 2 1/2 hours. Then add in the rice and cook for an additional 1 hour. These are just estimates since I haven’t tried it for myself. You can be sure I’ll be creating a recipe for it soon though!